I've been lucky enough to work on the development of the Curio software service, which focuses on bringing together public communities and professional environmental operators (managers, planners etc) to provide better, more effective management of local ecosystems and green infrastructure. There are two core aspects to Curio. 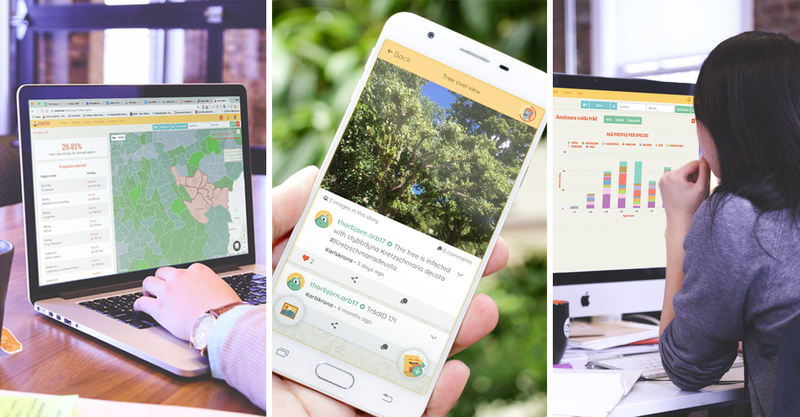 On the one hand, it provides the public with access to detailed information on local environmental features, in order that they can better understand the role and nature of local ecosystem services and biodiversity. It also enables them to contribute toward the preservation of local areas through simple monitoring and habitat mapping tasks. - universities and schools to manage their campus green infrastructure as well as turning their campuses into interactive classrooms for students in arboriculture, zoology, ecology etc. It is also being used by individuals in communities around the world who have a passion for caring for their local area and sustaining its biodiversity. 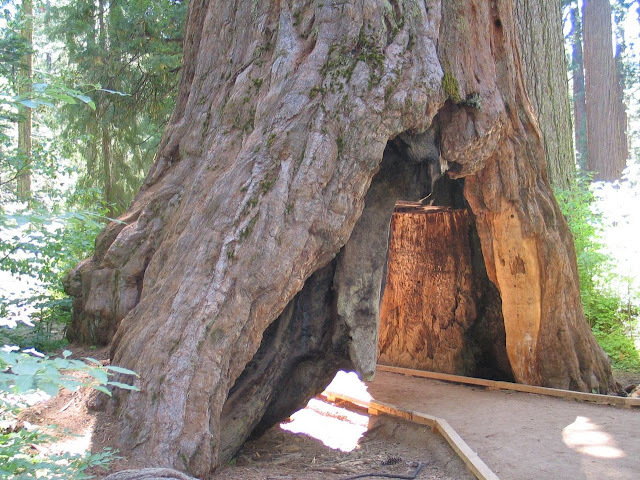 The Pioneer Cabin Tree was a giant sequoia in Calaveras Big Trees State Park, California. Sadly it fell during a storm on January 8, 2017. Impressive and all as it is to drive a car through a tree, hopefully in the future we will have the wisdom to go around them. So this is our new thing - Curio! We've been building it a while and have just finished polishing the chrome. Like life, it won't be done till it's done but we're happy now that it's ready for its first baby-steps into the wider world. So who or what is Curio? When the Pioneer Cabin tree fell in a recent storm, many of us realised that we knew of this tree and some of its story. Without pictures and physical records of its history, it may have come down without making a sound. The same is true for any tree and Curio offers the chance to maintain a living memory of these trees. In a nutshell, Curio is a mobile app and web service that supports people in learning about and improving their local environment. It does this through connecting individuals, organisations and communities with the trees in their midst so that they can discover the species and stories of any tree as well as other key environmental information. By sharing photos and our own personal experiences, we can each contribute to preserving the cultural heritage of the trees amongst us whilst opening up to others the ability to share in their lasting significance. More importantly, with every photo, story and observation you share, you will also be directly contributing to the care protection and awareness of your local environment by providing valuable insight on local biodiversity and natural amenities. Pride and sense of place is important and is often inextricably linked to the cultural heritage of the places we live. Oftentimes, people don't pay much attention to the trees about them until someone is standing in the street with a massive chainsaw and by then it's generally too late. Curio aims to increase public awareness of these trees, not just through the sharing of stories and experiences but also through highlighting the very real environmental, financial and health benefits that they offer simply by standing there, swaying in the wind. Of course, sometimes the power-saw is a requirement too and Curio helps to provide a context for when and why drastic remedial works and interventions are necessary and also to give a means of monitoring the results. By connecting the public with each other and with the organisations responsible for the management and care of these trees, Curio will also improve the quality of care and effectiveness and transparency of management decisions taken on the public's behalf. How did Curio come about? If you're not interested in us going on about Curio's comicbook-superhero-backstory then feel free to skip this section. But a long time ago in a galaxy far far away (June 2016, in Ireland!) a couple of old friends decided they would like to focus their work on projects that deliver positive social and environmental benefits. To this end Curio was born as a way of empowering communities and individuals to easily take an active role in improving the environment whilst learning (if they like learning) and having some fun (if they like fun) along the way. To underpin the services that Curio provides, some pretty special technologies have been built. Part of the wider service is being designed and developed under contract with the European Space Agency, who have supported this work through the Curio Canopy demonstration project. Through this work we will be incorporating a number of satellite-based services that improve our ability to map and monitor urban forest changes and provide up-to-date information to people anywhere in the world. So that's pretty much it. We hope that by using Curio you will enjoy discovering a bit more about the areas around you and we know for sure that by using it and sharing your observations you will be helping to protect the environment and contribute to sustainable management practices.